The cleft graft is a simple, low-skill graft to try. You don’t need finesse with a knife or complex equipment: your grafting knife and a butcher’s cleaver, saw, or similar home tool and little else are all you need to try it out on a fat, living rootstock. A fresh tree stump will do. Cleft grafts are for joining scions to a relatively large piece of wood, the size of a major branch or as large as a stump. You could use a cleft graft to topwork a tree to turn it into a new type of tree, or to change over parts of it. If you want to create a novelty fruit tree in which you combine, for example, many different apples on one tree, a cleft graft is a graft you might use on fat, major scaffold branches (a graft for somewhat smaller branches would be the side-stub graft). Early spring: all plant material should be dormant. Ideally, this graft is made when the buds of the rootstock are beginning to swell. If you cannot see buds, approximate with a time in late winter. Rootstock: large, 2.5 to 10 inches recommended. The top of the rootstock should be at a straight-grained section of wood. A knobby or knotty section will make the cleft untrue and raise the chance of failure. Scion: one-year-old wood sawed off flat at the base, and fairly long. It should have at least three buds beyond the lowest six inches of growth. Usually, you use two scions per cleft. Clefting tool. This is a specialized tool for exactly this kind of graft. It has a long wedge blade area blade for splitting and a hook end for prying and holding the cleft apart. Unlike most other grafts, there is a way to cleft graft with just simple tools. 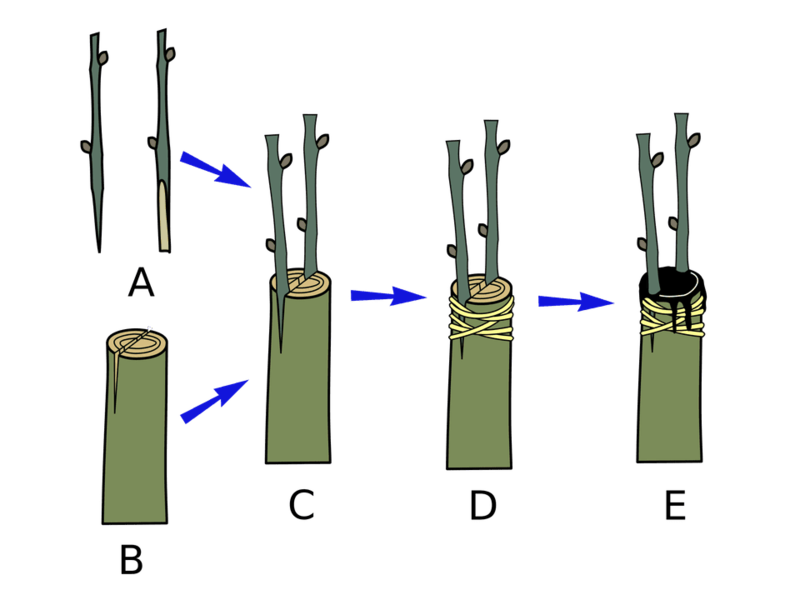 You should still make the graft in very early spring and use the rootstock and scion described above, but the tools described below can take the place of the specialized implements above. Instead of a grafting knife: a high quality and sharp paring knife or pocket knife may suffice to cut the one-year wood. For the clefting tool, a butcher’s cleaver, ax, long chisel, or similar tool may suffice. A saw may work, too. A fat chisel will be helpful. Instead of a mallet, a hammer or even a two-by-four or a block of wood will do. No wax? If you are working on a very low stump, you can pile soil on the whole stump, the cleft and all around the union and this may work to seal in moisture well enough. Cleave the rootstock: Position your cleaving tool on the diameter on top of your rootstock. Using your mallet, drive it in. You want the split to go down about six inches. Leave a fat chisel, wedge, or similar tool in the cleft center to hold it open. Make a long wedge at each scion’s base. This wedge is long and tapering to a point, about six inches long total. If you are skilled enough with the grafting knife to do it, the two faces of the wedge should not be parallel to each other, but rather on a slight angle to create a fatter non-face side and a thinner non-face side. This will better fit into the cleft. Insert the scions the full depth of their wedge bottoms. Two scions go in each cleft, one at each point where the cleft intersects the ring of cambium. This ring is located just inside the bark of the rootstock and scion. Try to line up the cambium layer of the scion with the bark as you insert it. If the scion wedge you made was the more advanced, non-parallel faces type, the fatter side goes to the outside of the cleft. Using wax or soil, seal the unions against drying. Follow up with general aftercare, such as humidity control, until the union fully takes. Also, at some point after your scions have grown on, choose the healthiest and truest-growing of the two scions, and eliminate the other. Hartmann, Hudson T. and Dale E. Kester. Plant Propagation Principles and Practices, 7 ed. 2002.